President Barack Obama called the crew of the shuttle Atlantis late Wednesday and congratulated the astronauts on the successful overhaul of the Hubble Space Telescope. He also promised to name a new NASA administrator soon, although he provided no clues as to who might get the nod. "We're soon going to have a new NASA administrator," Obama told the astronauts. "I can't disclose it to you because I've got to have some hoopla on the announcement back here on Earth. But I can assure you that it's a high priority of mine to restore that sense of wonder that space can provide and to make sure we've got a strong sense of mission, not just within NASA but to the country as a whole." Atlantis commander Scott Altman jokingly asked the president, "just so we're sure, the new administrator's not any of us on the flight deck right now, is it?" Obama laughed, and said "I'm not going to give you any hints." "Thank you very much, fair enough, sir," Altman said. Charles F. Bolden Jr., a former fighter pilot, Marine Corps major general and veteran space shuttle commander, is widely rumored to be the top candidate for the job. 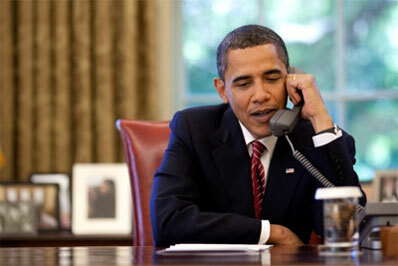 Bolden met with Obama at the White House on Tuesday. During today's phone call to the Atlantis astronauts, Obama said "I wanted to personally tell you how proud I am of all of you and everything that you've accomplished." "Like a lot of Americans, I've been watching with amazement the gorgeous images you've been sending back and the incredible repair mission you've been making in space," he said. "I think you're providing a wonderful example of the kind of dedication and commitment to exploration that represents America and the space program generally. These are traits that have always made this country strong and all of you personify them." "Well thank you very much, sir," Altman replied. "I think you are exactly right, this mission has been an example of what our country can do as we work together. It's been the teamwork of all the folks on the ground, in addition to the folks outside spacewalking, making this all come together and work for us." The president said watching the Hubble repair spacewalks was "amazing, and Dr. Grunsfeld, I was moved by your observation that the Hubble is more than just a satellite, but an iconic symbol of our quest for knowldge. I thought that captures accurately the work that you guys are doing." Lead spacewalker John Grunsfeld told Obama "it's almost impossible to go into any K-through-12 classroom these days and not see Hubble images on the walls, inspiring kids to do great things and maybe some of them to become astronauts some day and push our frontiers even further." "Well, I know you've excited my 10-year-old and my 7-year-old," Obama said. "By allowing Hubble to continue on its journey, you've really allowed all of us to continue on our journey of growth and exploration. You know, here in Washington, there's a lot of talk about clarifying our focus, our vision for where the country needs to go. And I really think that what you guys represent is an example of what 'vision' means. "The space program's always described our willingness to stretch beyond current boundaries and to look at things in new ways," Obama said. "So in that way, you inspire us all and I'm hoping you guys recognize how important your mission is to the world as well as to this country." NASA's Mission Management Team, meanwhile, completed a detailed review of imagery and laser scans from a late inspection of the shuttle Atlantis' heat shield Tuesday. MMT Chairman LeRoy Cain said the team gave Atlantis a clean bill of health and cleared the ship for re-entry and landing Friday, weather permitting. "In the Mission Management Team (meeting) today, we had the opportunity to review the results," said MMT Chairman LeRoy Cain. "As you know, yesterday the crew performed the late inspection of the wing leading edge and the reinforced carbon carbon of the nose cap. They pored over all that data throughout the evening and this morning, and at the Mission Management Team today, they reviewed that data with us and the results are we don't have any issues as it relates to the thermal protection system ... So we have cleared the TPS and the vehicle for safe deorbit, entry and landing. That was a great milestone for us." Landing currently is targeted for 10:01 a.m. Friday at the Kennedy Space Center. But forecasters are predicting a chance of low clouds and rain in the area and as a precaution, the astronauts were asked to power down non-essential equipment Wednesday to conserve hydrogen and oxygen used by the shuttle's fuel cell system to generate electricity. 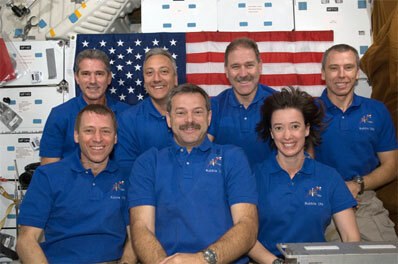 As it now stands, the crew will have enough supplies to remain in orbit three days beyond Friday. NASA does not plan to staff its backup landing site at Edwards Air Force Base, Calif., on Friday, but depending on the weather, backup sites could be activated Saturday if necessary. At the Kennedy Space Center, engineers are continuing to work through a countdown to ready the shuttle Endeavour for launch on an emergency rescue mission if a major problem crops up that might prevent a safe re-entry. Because the Atlantis astronauts cannot reach the International Space Station for "safe haven," Endeavour has been prepped for a quick-response launch if needed. Going into the Hubble Space Telescope repair mission, NASA managers planned to release Endeavour from rescue stand by duty after Atlantis' heat shield was cleared for entry. But Cain said he decided to keep Endeavour on standby at least through Thursday and possibly as late as Atlantis' deorbit rocket firing Friday "because I can, and it doesn't affect (Endeavour's next flight in June)." "I was willing to go as late as deorbit on Friday," he said. "I'm going to evaluate that again tomorrow." Because Atlantis is near the end of its mission, most of its on-board supplies have been used up and even with the power downs implemented today, the crew will run out of oxygen for its fuel cells by some point late Monday or Tuesday. For Endeavour to have any chance of reaching the crew in time, should something prevent a normal re-entry, the rescue shuttle would have to take off by Saturday or Sunday at the latest. Cain said mission managers do not anticipate any such problems and expect Atlantis to make a normal re-entry on its own. But in the meantime, NASA is protecting its options as planned.